Dr. Con Murphy, (left) presenting a cheque for €20,000 to Cork Simon, the proceeds of the Gala Tribute Night which took place at Cork City hall honouring Dr. Con’s long and outstanding service to the GAA in Cork. 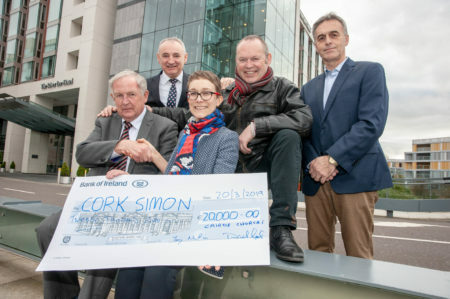 Included are Rachel Stevenson, Head of Fundraising, Cork Simon and Dermot Kavanagh (centre, back), Director, Cork Simon. Also included are Diarmuid Lynch and Tony Nation (right), organising committee Cairde Chorcaí. 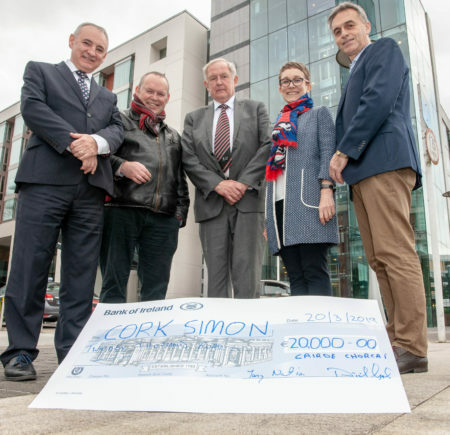 Dr. Con Murphy, presenting a cheque for €20,000 to Cork Simon, the proceeds of the Gala Tribute Night which took place at Cork City hall honouring Dr. Con’s long and outstanding service to the GAA in Cork. Included are Rachel Stevenson, Head of Fundraising, Cork Simon and Dermot Kavanagh, Director, Cork Simon. Also included are Diarmuid Lynch (let) and Tony Nation (right), organising committee Cairde Chorcaí.